Early History In July 18631, Councillor Edward Davy proposed that a formal application be made to the State government to use the land for this purpose. The result was that an area of 23 acres 3 roods (9.6 ha), including the river and lagoon, was temporally reserved and gazetted as a Public Garden on 9 September 1863. The boundaries were the railway fence, Ellesmere St, Clarendon St and Mollison St. A Gardens Committee was formed of Councillors Davy, McKenna and Tyson to oversee the Garden's management Councillors McGrane and Evans were added later in the year). The first summer saw a flurry of activity, with about 6 people being employed to fence the area. The ground was prepared for autumn planting and council allocated funds for seeds, tree planting, ornamenting and otherwise improving the Gardens. On one occasion, the cricket team and their friends were invited to “give a day for digging, drawing, levelling, gravelling etc.” as a repayment for the work done on their ground by the council; the local MLA R.B.Tucker was to be field marshal for the day. Plants were sourced from the Melbourne Botanic Gardens, Joseph Harris (South Yarra Nurseries), Handasyde McMillan & Co. (Melbourne) and the State Nursery at Macedon. Towards the end of 1864, it was reported that extensive planting had taken place. It is not known, however, if there was a formal plan for the layout of the Gardens or whether there was ever a formal opening ceremony. Seats were added in 1867. Despite the efforts to fence the site, stray cows, goats and geese repeatedly caused problems. In 1866, the Gardens began to be reduced in size. Six acres was excised on the far side of the river, with the support of the Council, to be used as part of water supply infrastructure. An additional one rood was excised, first for a Mechanics Institute but later changed to a site for a Town Hall (built 1868), thus leaving the Gardens at its present size of 6.28 ha. Trees and Shrubs Planting, removal and replacement of trees and shrubs has occurred throughout the life of the Gardens. A hedge of 1500 hawthorns was planted along the south-east boundary in 1877; at that time, 200 Eucalyptus globulus (Tasmanian Blue Gums) were also ordered. Oaks and plane tree s were planted between 1875 and 1900, although no plane trees remain. A substantial number of trees were removed in the 1920s-1940s and more were planted. Most of the pines in the pinetum probably date from that period (an aerial photo from 1946 shows that the pine canopies did not overlap then). An avenue of poplars parallel to Mollison St appears on the oldest photos and perhaps date to 1871. Over the years, this was used for running races. As early as 1917 the poplars were reported to be diseased. Most were removed in the 1950s but replacements have since been planted. Another significant live garden feature before 1900 was apparently a maze, possibly oval in shape and containing three rows of privet hedges. There are no photographs of the maze, though sections of curved double hedges around a small clearing are visible in aerial photographs from 1946. Excavations in 1984 failed to locate evidence of the maze. A Eucalyptus muelleriana was planted by Joan Kirner, then a State government minister, in 1985 to celebrate Victoria's sesquicentenary. Water Features The lagoon (or lake), a dominant feature of the Gardens, was referred to as a swamp in 1864, but has been deepened on a number of occasions when it dried out (including 1866, 1868, 1939). Water for the lagoon has long been an issue, particularly in drought periods. Originally run-off from Mollison St (the main street) was directed into the lagoon, but in the 20th century the main street was considered too polluted and diverted under the road and away from the Gardens. The main source was then just run-off from Ellesmere Place. For a long time the lagoon was fenced (certainly before 1909 when the fence needed mending), and a chicken-wire fence appears in photographs up to the 1960s or 1970s. The lake is now unfenced and its edges renovated with bluestone blocks in 1972. There are two islands, believed to be man-made, and once also a pile of rocks. A crude fountain was built on the island closest to the Town Hall in 1939, using stone from a disused store brought to the Gardens by Norman Carter on his horse & cart. This was restored in 1998, with water supplied by a PVC pipe (rather than restoring the original metal pipe). By 2008, however, the fountain was no longer functional. Many photographs from the mid-1900s show a rustic bridge connecting the two islands and (almost) to the mainland (this bridge was clearly only used by the gardener, since the gap to the mainland was crossed, when required, by a plank. The date of erection of the fence is uncertain; it is believed to have been removed in the late 1950s. A substantial bridge from the river side of the lake to one island was built about 1980. From around the time the fountain was built, the islands were populated by pampas grass; in recent years this has been replaced by much shorter, less invasive grasses. There was once a lily pond that connected to the lagoon via the “billabong”, now a curved ditch, but all that remains of the pond is a circular depression. Once again, there are no photographs of this feature. Other Features A memorial arch, celebrating those who died in the First World War, and flanked by an iron fence was erected in 1922 alongside the Town Hall. A bluestone drinking fountain, believed to be from the late 19 th century, was discovered in 1985 and re-sited in the gardens behind the town hall. A fish hatchery, a crude structure of concrete, corrugated iron and steel pipes, dates from 1958 and operated until 1965. For some reason this is a focal point in the Gardens and warrants an interpretive sign. The current toilets date from the 1960s. An earth closet was originally behind the Town Hall, replaced by a water closet in 1909. Sport and Recreation Sports have been located in the Gardens since its earliest days, although the Temporary Reservation was not amended to include public recreation (rather than just Public Gardens) until 1955. A three-rink lawn bowling green was installed in 1882 and had a small pavilion (the area is still recognisable alongside the river today). However, bowling only lasted until 1890. A tennis court was in existence by 1894 and took over the bowling pavilion as its clubhouse. A second court was added in 1928. The courts are now disused. At some point there may have also been a croquet club and a quoits club. Swings were erected around 1922-23; in 1940 there were four swings, two see-saws and a slide. Play equipment has been upgraded on several occasions since then. Curators and gardeners For much of their history, the Gardens have lacked a curator or even a full-time gardener. Much of the early work laying out the gardens and acquisition of plants was supervised by the Council Gardens Committee (the founding members were councillors Davy, McKenna & Tyson). In 1872 there was a petition to Council for on on-site gardener; this was supported, subject to funds becoming available. 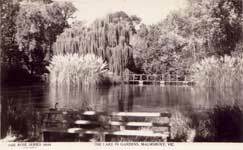 During the first World War, the Kyneton Botanic Gardens curator was asked for his advice, which he agreed to; requests were also made for the Kyneton gardener to spend time in the Malmsbury Gardens. From the 1930s until 1968 Norman Carter variously served as labourer, caretaker and gardener. From 1971 to around 1980, the Reverend Woods and the Mansions Community (see below). In 1985 Kevon Walsh was employed as gardener for a year. In recent years, Malmsbury, Kyneton and Gisborne Botanic Gardens have been looked after centrally by Macedon Ranges Shire, under the Parks Development Officer, Peter Jones. Rejuvenation of the Gardens By the 1970s the Gardens had become quite overgrown in places and required serious attention. Reverend Wood and the Mansions Community (a religious group) offered to restore and maintain the Gardens and cleared a significant amount of vegetation. In 1973, notices were put up banning horses and bicycles. In 1977 students from RMIT helped by cleaning up overgrown areas and rehabilitating the billabong. In the drought of 1982/3 the lake was cleaned out and elms removed from the mound encompassed by the billabong. The Victorian sesquicentenary saw the allocation of $35,000, which was used to label plants, remove and prune trees, plant new trees (supplied by Melbourne Botanic Garden), dredge the billabong, land grading and removal of a corrugated iron shed. The Macedon Ranges Shire Council continues to spend money on the Gardens, in particular carting water to keep the trees alive in the present drought. In 2009, changes to the drainage system from the town roads (back to an earlier arrangement), suggested by University of Melbourne horticulture student Andrew Smith, have eased the problems of lack of water entering the lagoon. 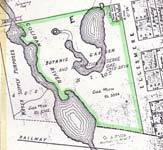 1The report by Gilfedder (and subsequent reports that quote it) states that the garden reserve is shown on an earlier town plan by Urquhart. Research by Susan Walter suggests that the gardens were not marked on the original plan, but were hand-written on to later copies. Back to top of page.